NPR interviewed dozens of current or former soldiers who said they have struggled under toxic leaders. Hollywood has portrayed military leaders as monsters in movies such as 1987's Full Metal Jacket about Marines during the Vietnam War. Army leaders wonder if this kind of toxic leadership is hurting its soldiers. Gen. David Perkins, who led the first troops into downtown Iraq in 2003, now runs the Combined Arms Center at Fort Leavenworth in Kansas. He says toxic leadership could have life or death consequences. Top commanders in the U.S. Army have announced publicly that they have a problem: They have too many "toxic leaders" — the kind of bosses who make their employees miserable. Many corporations share a similar problem, but in the Army's case, destructive leadership can potentially have life or death consequences. So, some Army researchers are wondering if toxic officers have contributed to soldiers' mental health problems. One of those researchers is Dave Matsuda. In 2010, then-Brig. Gen. Pete Bayer, who was supervising the Army's drawdown in Iraq, asked Matsuda to study why almost 30 soldiers in Iraq had committed or attempted suicides in the past year. "We got to a point where we were exceptionally frustrated by the suicides that were occurring," Bayer says. "And quite honestly feeling — at least I was — helpless to some degree that otherwise good young men and women were taking their lives." Matsuda might seem like an unconventional choice to study Army suicides. He's an anthropologist; the Army hired him to advise U.S. commanders on how to understand what was really going on below the surface in Iraq. But Bayer says those skills are what prompted him to ask Matsuda to look below the surface of the suicide problem in the Army. "What we valued about [Matsuda], as well as a few others who worked for us, was he didn't wear a uniform. He wasn't one of us, so to speak," Bayer says. Whenever a soldier committed suicide, Bayer says, a team of Army investigators would essentially ask the same questions: What was wrong with the individual soldier? Did he or she have a troubled childhood or mental health problems? Did the soldier just break up with a partner or spouse? Was he or she in debt? The answer was often "yes." But Bayer says he felt part of the puzzle was missing. "We decided we were going to take a look at it from a different angle," he says. So Matsuda looked at the cases of eight soldiers who had recently killed themselves and interviewed friends of the victims. "I crisscrossed Iraq and interviewed 50 soldiers," Matusda recalls. A more complicated story began to emerge, he says. In addition to major problems in their personal lives, the victims also had a leader who made their lives hell — sometimes a couple of leaders — Matsuda says. The officers would "smoke" them, as soldiers call it. "Oftentimes platoon leaders will take turns seeing who can smoke this guy the worst. Seeing who can dream up the worst torture, seeing who can dream up the worst duties, seeing who can make this guy's life the most miserable," says Matusda. He says the evidence did not show that the soldiers' leaders caused them to commit suicide. But the soldiers' friends said leaders had helped push them over the brink. "When you're ridden mercilessly, there's just no letup, a lot of folks begin to fold," Matsuda says. He submitted a report stating: "[S]uicidal behavior can be triggered by ... toxic command climate." "Given an institutional objective to establish and maintain effective command climate," Secretary Thomas White Jr. wrote, "how can the Army effectively assess leaders to prevent those with destructive leadership styles?" "The first thing that struck me was, what a good question," says retired Col. George Reed, who was director of Command and Leadership Studies at the War College. "It was not a question that we had wrestled with before." Reed and a colleague interviewed dozens of officers who were attending the War College. He says most of them told stories about recent encounters with leaders whom they said were toxic. 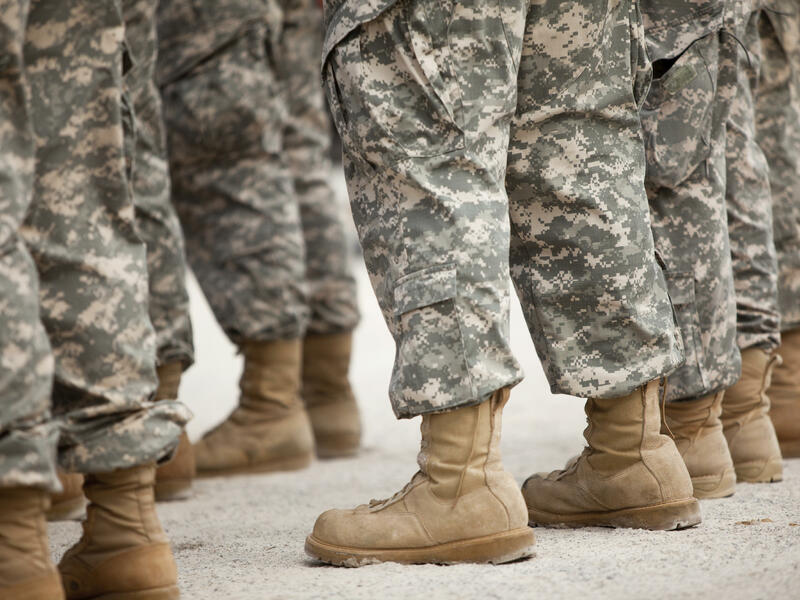 He says the soldiers were talking about something worse than incompetent bosses: They said toxic leaders were abusive and self-aggrandizing, arrogant and petty, and "unconcerned about, or oblivious to, staff or troop morale." Toxic leaders were also good at snowing their superiors — so they kept getting promoted. Reed says after Military Review published his article about the study, he was flooded with emails from other soldiers who complained about the toxic leaders they knew. "The stories just poured out at that point," Reed, who now teaches leadership studies at University of San Diego, says. "It was distressing because the Army is a world-class organization and at some point you have to ask, 'No, really? Are we tolerating this kind of leadership behavior?' "
Gradually, some generals started to ask that question and a few years ago they ordered researchers to do the first nationwide study to help answer it. Researchers based at the Center for Army Leadership at Fort Leavenworth in Kansas surveyed more than 22,000 troops in 2009 and 2010. Most commanders received good ratings, some even got great ratings. But the study found that roughly 20 percent of soldiers reported their own leaders were what researchers called toxic. NPR has interviewed dozens of current or former soldiers who say they have struggled under those kinds of leaders. We found one of them, Frank Costabile, at a center for homeless vets in Las Vegas. The Army discharged him last year after the third time he threatened or attempted suicide. "I'm doing better," says Costabile, who had been a private first class fueling helicopters, tanks and trucks. "After my last suicide attempt, they gave me a new medication." Costabile says he never heard the term toxic leadership while he was in the Army. But he says some of his own leaders started tormenting him psychologically three years ago in Afghanistan, and the abuse continued when he came home in 2011 to Fort Carson in Colorado. He says those leaders didn't scream at him, they ostracized him. And the more he felt like he was falling apart, the worse it got. Army records show he had "major depressive episodes" and "multiple hospitalizations." "Like the kid that was picked last for kickball in school, you know? I get the jobs that nobody wanted to do. Take out the trash, you're going to sweep the floor, you're going to mop the hallway. And it's like, why?" Costabile says. Army records show that Costabile stopped eating more than a few bites each day; he lost 30 pounds in a month. His wife found him lying on the bathroom floor after he took dozens of antidepressants and other pills. But some officers said he was faking it. "And I just had feelings, like, that nothing's ever going to change," Costabile says. "I'm going to get [expletive] every day, and I just don't want this anymore. And I just felt like I wanted to kill myself." Lt. Gen. David Perkins, who commands the Combined Arms Center at Fort Leavenworth, says he knows how toxic leadership can hurt soldiers — and the Army. "If we don't do something about toxic leadership, I mean in the end, not to be too dramatic, but it does have life or death consequences. And quite honestly, we owe it to the American public," Perkins says. He continues: "I can just tell you from experience ... that if you have toxic leadership, people will get sort of what we call the 'foxhole mentality.' They'll just hunker down and no one is taking what we call prudent risk." Perkins led the first U.S. Army troops into downtown Baghdad after the U.S. invaded Iraq in 2003. "They're not being innovative, they're not being creative. And some people who are toxic leaders, they might be able to get some short-term results and get an immediate mission at hand done. But in the process, they are destroying the organization and destroying their people." Perkins says the first step to figuring out what to do about toxic leaders was to define the problem. So in 2012, the Army revised its leadership bible, Army Doctrine Publication 6-22, to detail what toxic leadership means for the first time. "Toxic leadership is a combination of self-centered attitudes, motivations, and behaviors that have adverse effects on subordinates, the organization, and mission performance. This leader lacks concern for others and the climate of the organization, which leads to short- and long-term negative effects. The toxic leader operates with an inflated sense of self-worth and from acute self-interest. Toxic leaders consistently use dysfunctional behaviors to deceive, intimidate, coerce, or unfairly punish others to get what they want for themselves. The negative leader completes short-term requirements by operating at the bottom of the continuum of commitment, where followers respond to the positional power of their leader to fulfill requests. This may achieve results in the short term, but ignores the other leader competency categories of leads and develops. Prolonged use of negative leadership to influence followers undermines the followers' will, initiative, and potential and destroys unit morale." The Army then launched a pilot project to take a second step toward dealing with the problem: In addition to having leaders evaluate their subordinates, as just about every institution does, they asked subordinates to evaluate their leaders — anonymously. The pilot project evaluated only eight commanders, in what the Army and management specialists call a 360 evaluation, but Perkins says the Army plans to expand the system by October 2014. Meanwhile, Army commanders have taken more aggressive steps: They have kicked a small number of officers out of their jobs for being toxic. And the issue is becoming part of a national conversation. Sen. Kirsten Gillibrand (D-N.Y.) told the Senate chamber recently that destructive leaders are one reason why the number of sexual assaults in the military is so high. "You've just heard from these victims, there are too many command climates that are toxic," she said. Some of the Army researchers who first raised the issue of toxic leadership say this is clearly a new world. Still, they're concerned that Army leaders are not moving fast enough to confront it. Walter Ulmer, a retired general who led forces in Vietnam, calls toxic leadership an "institutional cancer." He says he's "enthusiastic and optimistic" that top officials are publicly discussing the problem and debating ways to combat it, but he says the Army strategies like the new officer evaluation system are just one step. According to the Army's plans, for example, it will ask subordinates to anonymously evaluate roughly 1,100 battalion and brigade commanders by late next year. But there are more than 100,000 officers in the Army, from noncommissioned sergeants to generals. If you used a 10-point scale to rate how well the Army is doing tackling toxic leadership, Ulmer — whose papers on the issue are taught in the Army's command schools — says, "I guess I give it maybe, maybe a six." The Army is doing more about toxic leaders than at any time in the past, he says, but there is "still a long way to go." Matsuda, the researcher who concluded that toxic leaders had played a role in the suicides of eight soldiers in Iraq, says even though the study was small and anecdotal, it raises a big question: Have toxic leaders played a role in many more suicides? The Army and the National Institutes of Mental Health have launched the biggest study yet of why soldiers kill themselves. One of the study's directors says that they're only just starting to ask whether there might be a link with toxic leadership. And I'm Audie Cornish. We're going to spend the next few minutes talking about a problem many Americans have faced in the workplace: toxic leaders, bosses who make you and your coworkers miserable. Only, our story is not about corporate America. Officials in the U.S. Army have concluded that they have too many toxic leaders. In fact, as NPR's Daniel Zwerdling reports, some Army researchers wonder if toxic officers are partly to blame for some soldiers' mental health problems. DANIEL ZWERDLING, BYLINE: One of those researchers is Dave Matsuda. And to understand why he's worrying about this issue, you need to hear his story. Matsuda was walking down the hall one day in one of Saddam Hussein's former palaces. This was back in 2010, in Baghdad. The U.S. Army had turned the palace into its Iraq headquarters. And Gen. Pete Bayer walked up and he said, hey, Doc - everybody calls Matsuda Doc. DAVE MATSUDA: And Brig. Gen. Bayer stopped me, and he said, "I have a mission for you." And so I replied, "What are your orders?" ZWERDLING: And here, Gen. Bayer picks up the story. Bayer was the general in charge of getting the U.S. Army out of Iraq, as the war was winding down. He says he told Matsuda that almost 30 soldiers in Iraq had committed or tried to commit suicide, in just the past year. GEN. PETE BAYER: We got to a point where we were exceptionally frustrated by the suicides that were occurring and quite honestly, feeling - at least, I was - helpless, to some degree, of otherwise good young men and women who were taking their lives. MATSUDA: And he just said, how do we reverse this trend? How do we stop it? ZWERDLING: Bayer says that day back in Iraq, he ordered Doc Matsuda to study why have so many soldiers in Iraq wanted to kill themselves? BAYER: What we valued about Doc, as well as a few others who worked for us, was he didn't wear a uniform. He wasn't one of us, so to speak. ZWERDLING: Doc Matsuda is not a soldier. He's an anthropologist. The Army hired him to advise U.S. commanders: How do you understand what's really going on in Iraq below the surface? Bayer says now, he wanted Matsuda to look below the surface of the suicide problem in the Army because he says whenever a soldier committed suicide, the Army's official investigators basically asked the same questions: What was wrong with the individual soldier? Did he or she - usually, he - have a troubled childhood, mental health problems? Did he just break up with his girlfriend or wife? Was he in debt? And the answer was often yes. But Bayer says he felt part of the puzzle was missing. BAYER: We decided that we were going to take a look at it from a different angle. ZWERDLING: So Matsuda took that look at the cases of eight soldiers who'd recently killed themselves. He met with as many of their buddies as he could. MATSUDA: I crisscrossed Iraq and interviewed 50 soldiers. ZWERDLING: And Matsuda says those soldiers told him a more complicated story than the official investigations found. Yes, the victims had major problems in their personal lives. But in addition, every victim had also had a leader who made his life hell - sometimes, a couple leaders. The officers would smoke him - that's what soldiers called it. MATSUDA: Oftentimes, platoon leaders will take turns seeing who can smoke this guy the worst - seeing who can dream up the worst torture, seeing who can dream up the worst duties, seeing who can make this guy's life the most miserable. When you're ridden mercilessly, there's just no let-up. A lot of folks begin to fold. ZWERDLING: Matsuda says the evidence did not show that the soldiers' leaders had caused them to commit suicide. But the soldiers' friends said their leaders had helped push them over the brink. So are you saying that so-called toxic commanders were one of the main reasons that those soldiers attempted or committed suicide? ZWERDLING: Of course, the idea that officers can be monsters is an old Hollywood cliche. 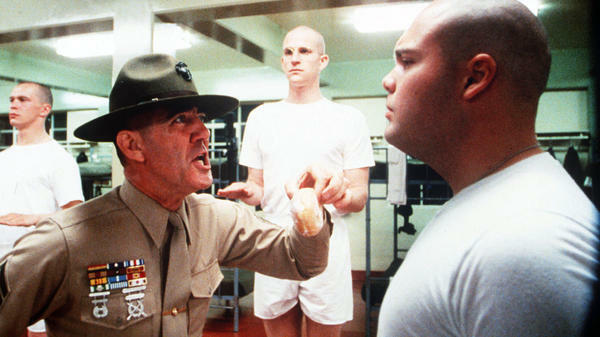 This is from "Full Metal Jacket," back in the '80s. They're Marines. ZWERDLING: The scene often made people laugh and wince. But about 10 years ago, the head of the Army decided the idea that that some leaders might be awful is more than a cliche. It's worth studying. COL. GEORGE REED: Understanding that good command climate is important, the secretary of the Army asked us, what is the impact of destructive leadership? ZWERDLING: Col. George Reed ran the Command and Leadership Program at the Army War College in Pennsylvania. REED: Well, the first thing that struck me was what a good question. It was not a question that we had wrestled with before. ZWERDLING: Reed and a colleague interviewed dozens of officers who were attending the War College. And he says most of them told stories about recent encounters with leaders who they said were toxic. Reed says the soldiers were talking about something worse than incompetent bosses. They said toxic leaders were mean and abusive. They bullied their troops; they didn't listen to them. Reed says after a military journal published their study, they were flooded with emails from other soldiers who complained about toxic leaders they knew. REED: The stories just poured out, at that point. ZWERDLING: And did that surprise you? REED: Well, it was distressing. It was distressing because the Army is a world-class organization. And at some point, you have to ask, no - really? Are we tolerating this kind of leadership behavior? ZWERDLING: Gradually, some generals started to ask that question. And a few years ago, they ordered researchers to do a nationwide study about the problem. Army researchers surveyed 22,000 troops. Most commanders got good ratings; some got great. But the study found that roughly 20 percent of the soldiers - almost 1 in every 5 - reported that his or her own leader was toxic. Toxic was the researchers' word. NPR has interviewed dozens of soldiers who say they struggled under those kinds of leaders. One of them is Frank Costabile. FRANK COSTABILE: I'm doing better. Like, after my last suicide attempt, they gave me a new medication. ZWERDLING: Costabile's job with the Army in Afghanistan was fueling helicopters, tanks, trucks. The Army discharged him just over a year ago, after the third time he threatened or attempted suicide. Now, he's living at a center for homeless vets in Las Vegas. We talked with him as dozens of vets lined up in the cafeteria. COSTABILE: How's it going, buddy? UNIDENTIFIED MAN: Talk to me. COSTABILE: I'll have some of that wing. UNIDENTIFIED MAN: This has got turkey in it. COSTABILE: It's not exactly the greatest, but it's better than sleeping on the street or at a Salvation Army, you know? ZWERDLING: Costabile says he never heard the term "toxic leadership" while he was in the Army. But he says some of his own leaders started tormenting him three years ago in Afghanistan - and it kept up when he came home to Fort Carson, in Colorado. He says they didn't scream at him; they ostracized him. And the more he felt like he was falling apart, the worse it got. COSTABILE: Like the kid that was picked last for kickball in school or something, you know? I get the jobs that nobody wanted to do. Take out the trash, you're going to sweep the floor, you're going to mop the hallway. And it's like, why? ZWERDLING: Army records show that Costabile pretty much stopped eating. He lost 30 pounds in a month. His wife found him lying on the bathroom floor after he took dozens of antidepressants and other pills. His officer said, he's faking it. COSTABILE: And I just had like, feelings - like, that nothing's ever going to change. I'm going to get (beep) every day, and I just don't want this anymore. You know, I just felt like I wanted to kill myself. LT. GEN. DAVID PERKINS: If we don't do something about toxic leadership - I mean, in the end, not to be too dramatic but it does have life-or-death consequences. And quite honestly, we owe it to the American public. ZWERDLING: That's Lt. Gen. David Perkins. He runs the Combined Arms Center at Fort Leavenworth, in Kansas. They train the Army's officers to fight wars. 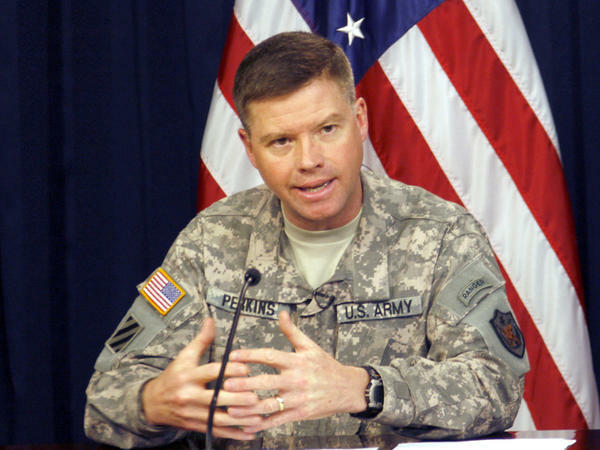 And back when the U.S. invaded Iraq, Perkins led the first troops into downtown Baghdad. He knows what kinds of commanders you need. PERKINS: I can just tell you from experience - I mean, gone into units - that if you have toxic leadership, people will get sort of what we call the foxhole mentality. They'll just hunker down. And no one is taking what we call prudent risk - they're not being innovative, they're not being creative. And some people who are toxic leaders, they might be able to get some short-term results and get an immediate mission at hand done. But in the process, they are destroying the organization and destroying their people. ZWERDLING: Think about this for a moment. The Army's not the only institution with destructive leaders. Corporations have them, too. But when was the last time you heard one of your own bosses say publicly, "We have too many toxic executives in our company"? Perkins says the first step in the Army was to define the problem. PERKINS: Page 3, I think, subparagraph 11. ZWERDLING: Last year, the Army revised their leadership bible. The official name is Army Doctrine Publication 6-22. It officially defined toxic leadership for the first time. Perkins reads an excerpt. PERKINS: (Reading) Toxic leaders consistently use dysfunctional behaviors to deceive, intimidate, coerce or unfairly punish others to get what they want for themselves - yeah, so we're not really mincing any words, I don't think, there. ZWERDLING: Then, the Army recently took a second step toward dealing with the problem. They did a pilot project on a new way to evaluate officers. Until now, the Army has done what most companies do. The big bosses evaluate the leaders below them and if the big bosses give them a good rating, then the subordinates generally get promoted. But in the pilot project, they asked subordinates to evaluate their bosses anonymously. The pilot project was tiny; they rated only eight commanders. But the Army plans to expand the system late this year. Meanwhile, top officials have kicked a small number of commanders out of their jobs for being toxic, and the issue is becoming part of the national conversation. UNIDENTIFIED WOMAN: Senator from New York. ZWERDLING: Sen. Kirsten Gillibrand said just a couple months ago that destructive leaders are one reason why the number of sexual assaults in the military is so high. GILLIBRAND: And you just heard from these victims, there are too many command climates that are toxic. ZWERDLING: Some of the Army's first researchers who ever raised the issue of toxic leadership say this is clearly a new world now. Still, they're concerned that the Army's leaders aren't moving fast enough. On a zero-to-10 scale, when you think of what the Army could and should be doing to tackle this problem of toxic leaders, where is it now? WALTER ULMER: In terms of the Army's making these necessary changes, I guess I give it maybe a 6. ZWERDLING: That's a retired general named Walter Ulmer. He led forces in Vietnam. Today, the Army uses his writings about toxic leadership at their command school. Ulmer calls toxic leadership an institutional cancer. He says the new system of evaluating officers sounds like a promising way to begin treating the disease. But it's just one step. For instance, according to the Army's plans, they will ask subordinates to evaluate roughly 1,100 officers anonymously by October. But there are more than 100,000 officers in the Army, and Ulmer says just changing the way many more of them are evaluated is going to be a huge challenge on that zero-to-10 scale. ULMER: Knowing the bureaucracy, I can't much go above a 6, and I hope that I'm wrong on that one. ULMER: A long way to go. ZWERDLING: We began this story talking about the Army's study three years ago, about soldiers who killed themselves in Iraq. Remember the researcher, Dave Matsuda, found that eight soldiers who committed suicide all had toxic leaders; and those leaders, in effect, helped push them over the brink. Now, Matsuda would be the first person to tell you his study was small, anecdotal. But it raises a big question: Have toxic leaders played a role in many more suicides? The Army and the National Institutes of Health have launched the biggest study yet of why soldiers kill themselves. One of the study's directors told me that they're only just starting to ask whether there might be a link with toxic leadership. Daniel Zwerdling, NPR News. Transcript provided by NPR, Copyright NPR.